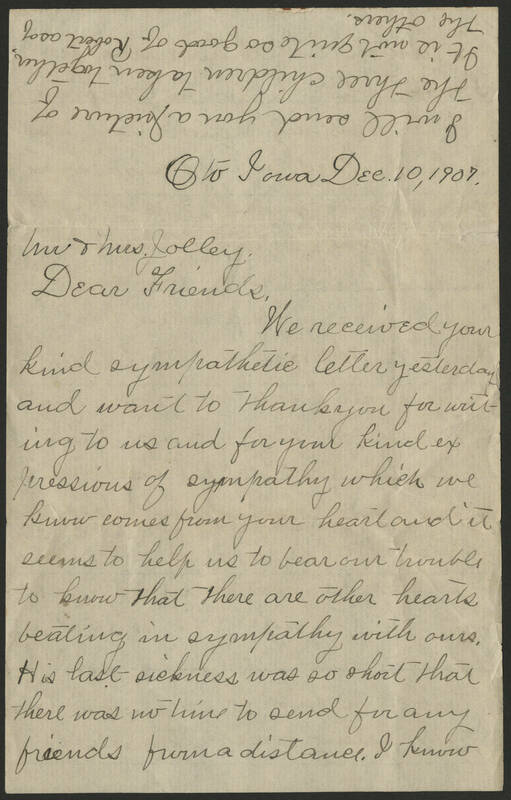 Oto Iowa Dec. 10 1907 Mr & Mrs. Jolley Dear Friends, We received your kind sympathetic letter yesterday and want to thank you for writing to us and for your kind expressions of sympathy which we know comes from your heart and it seems to help us to bear our trouble to know that there are other hearts beating in sympathy with ours. His last sickness was so short that there was no time to send for any friends from a distance. I know I will send you a picture of the three children (toben?) together. It is not quite as good of Robert as of the others.